Miodrag Veselinovic, a native of Belgrade, Serbia, is a prizewinner of many national and international competitions, including the Concorso Internacionale di Musica in Stresa, Italy. He appeared regularly on national television and radio broadcasts in his native country, and was awarded his Master of Arts diploma from the Academy of Music at the University of Belgrade. A winner of several prestigious scholarships, he studied at the University of Washington. An active performer, he appears regularly in solo, chamber, as well as orchestral concerts in the Seattle area as well as abroad. Formerly concertmaster of the University of Washington Symphony Orchestra, he is currently a member of the Federal Way Symphony. Mr. Veselinovic has been teaching students of all ages for several years privately as well as in academic institutions. His students all share his great enthusiasm and love for the violin and the string repertoire. This love in combination with his solid pedagogical and technical background, comprising study with some of the best teachers of the ex-Soviet Union, Western Europe, and the United States, allows him to approach each individual student with personally tailored guidance. 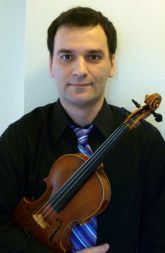 Mr. Veselinovic is passionately involved in chamber music, both as a performer and as a coach. Many of his student chamber ensembles have received high acclaim in performances in Seattle and Bellevue.